Last weekend, as the first snowflakes of winter fell on New Hampshire, a local icon on the Seacoast was setting out for an afternoon swim. "Creekman," as he’s known to some, has been making long distance cold-water swims for charity for a decade now. But as NHPR’s Jason Moon reports, those swims are more than displays of physical prowess – they’re a chance for a beloved character to come alive. Listen: The "Creekman" pulls off another frigid swim for charity. We strongly recommend listening to this story. On the banks of Portsmouth’s Peirce Island, a small but musical crowd has gathered to witness a living legend. Gary Sredzienski, better known to some as Creekman, is just moments away from embarking on a three-mile swim around Portsmouth Harbor. 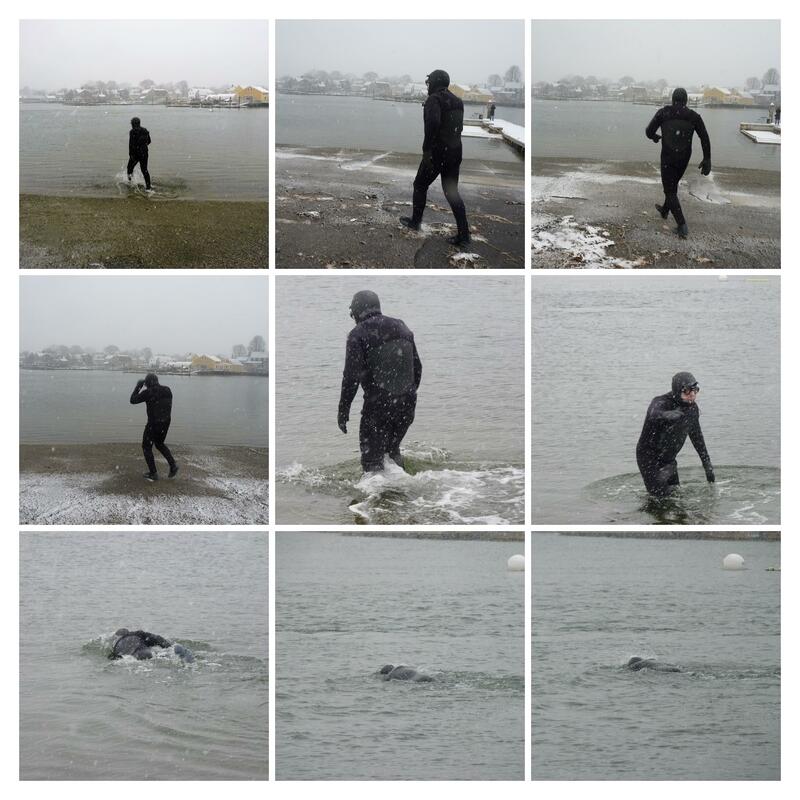 This is Sredzienski’s 10th long distance cold-water swim to benefit a charity. In years past, he’s taken to the water for everything from brain injury victims, to wildlife, to lighthouses. 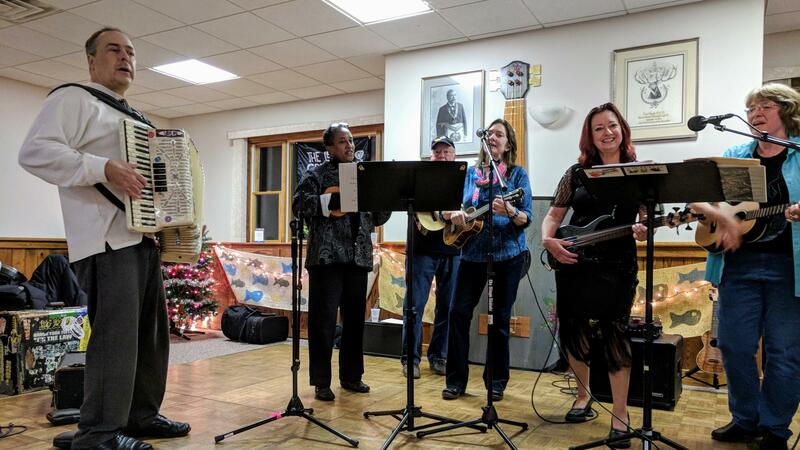 This year, the money raised is going to the Ukulele Kids Club. When he’s not swimming in icy waters, Sredzienski is host of the popular show Polka Party on the UNH campus radio station. Today though, he’s sitting in the passenger seat of a car keeping warm while he waits for the precautionary trail boat that will follow him during the roughly two-hour journey. To deal with the cold temperatures for that long, Sredzienski has created his own wetsuit. It’s a mix of surfing gear, scuba gear, and homemade gear – Creekman’s own superhero costume. Now fully suited, Sredzienski makes his way down the slope toward the frigid water. Then, with a final sendoff from the crowd of admirers, Creekman trudges off, straight into the ocean. Among those nervously watching from shore is Sylvia Pollock. As Creekman slowly makes his way out to sea, Pollock remembers the first time they met. It was the day she was moved in next to him. A few hours later, Pollock says Sredzienski returned from his swim and introduced himself. The two went on to become good friends. Gary Sredzienski plays accordion after completing a two hour swim in frigid waters. Portsmouth, where a party was waiting for him. Sredzienski’s day wasn’t over, though. He was still scheduled to perform with his band, the Serfs, to keep raising money for the charity.